For the first quarter of the 2018 financial year, the company recorded a Total Revenue of $271.04million (2017: $227.91 million), representing a 19% increase. Cost of Sales for the quarter amounted to $161.94million, up 11% relative to $145.52 million booked at the end of quarter one 2017. As such, Gross Profits totaled $109.11million, up 32% year over year (2017: $82.39 million). The company reported Total Expenses of $83.32million, an increase of 9% when compared to the $76.13 million reported in 2017. Administrative Expenses amounted $49.71million ,up 16% relative to the $42.74million reported in 2017, while, Selling Expense was up 1% to close at $33.61million (2017: $33.38 million). This resulted in an Operating Profit of $26.83million, a increase of 258% on the prior period’s $7.5 million. 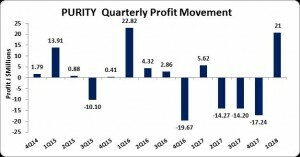 Pre-tax Profits decreased by 309% to $23.62million (2017: $5.78 million).. The Company paid taxes of $2.95 milli0n for the quarter versus none in the corresponding quarter of 2017. Net profit for the quarter was $20.67 million, a 258% increase, versus $5.78 million reported in 2017. As a result, earnings-per-share closed at $0.09 (2017: $0.03). The 12-month trailing LPS is -$0.112 and the number of shares used in our calculations is 222,709,171 units. Total comprehensive income amounted to $18.99 million. The Company, as at March 31, 2017, recorded Total Assets of $963.30 million, an increase of 26% year over year. Total Stockholders’ Equity as at March 31, 2018 was $735.40million, representing a decrease of 33%. This resulted in a book value of $3.30.